Better yet, if a regimental history exists it would, I would have to believe, include Sam Cullom if he did indeed “fight” from the war’s outset until its conclusion. In reality, few men served all the way through the war in any capacity simply because of attrition. Most who joined at the outset were killed, disabled or discharged because of illness, and many serving at the end had joined after the war had started. If Cullom was there from start to finish I can’t imagine any unit history would dare omit him, right? I didn’t find a compiled service record (CSR) for him at the National Archives. But we’ll see what others come up with. I’m particularly interested to see if anyone finds documentation of his stated military rank of Private. One can argue about the subjective meaning of words like “serve” or “fought,” but listing a military rank is a very specific, unambiguous claim. I have yet to come across a single instance of a black man being officially recognized during the 1861-65 period with a soldier’s rank by Confederate military authorities. I may be wrong, but I ain’t holding my breath. There are a tiny handful of men who, to best assessment, appear to have routinely and consistently functioned in the same capacity as formally-enlisted soldiers. Holt Collier, a scout, would be an example of this. But they are very, very few in number, and are very atypical. I have not had the opportunity to do any digging into this man’s story, but I did come across a claim in William C. Davis’ The Cause Lost: Myths and Realities of the Confederacy about southern blacks and the Confederacy that made me scratch my head. He cites his own work, “A Government of Our Own”: The Making of the Confederacy. I have never heard of such claims before. I’m surprised proponents of the Black Confederate myth do not point to this as evidence of southern black’s devotion to The Cause. Thoughts? He cites his own work, “A Government of Our Own”: The Making of the Confederacy. But there were plenty of examples of that, notably the case of the Louisiana Native Guards, which the Davis government in Richmond wanted no part of. I presume they kept the bonds, though. I wish there was more information about these individuals. Curious that they should not only side with the Confederacy, but seek to aid in defeating the North. Granted, at that early stage in the war, it wasn’t so clear what an emancipating force the presence of the Union army could be. But as I said before, interesting that we don’t see the Black Confederates folks pointing to this evidence like they do the 1865 attempt at arming slaves. I did just look up the Louisiana Native Guards. How interesting that upon their disbandment, some joined Union regiments. Perhaps it was initially more about wanting to prove their worth as citizens than it was about what side of the fight they fought on? Thanks for bringing this to my attention. You can easily see what the slaves and freemen were thinking. Fighting for the country might give them freedom or solidify their place and possible citizenship. It worked that way for the USCT. You can also easily see why the Confederacy refused to accept black men as soldiers. They stated it over and over again until the bloody end. “If slaves will make good soldiers our whole theory of slavery is wrong.” General Howell Cobb, January 8, 1865. O.R. Ser. 4, Vol. III, pp 1009-10. I’m not having any luck finding proof of military service either, beyond the generic “served his unit” as found in the comments in his pension application. 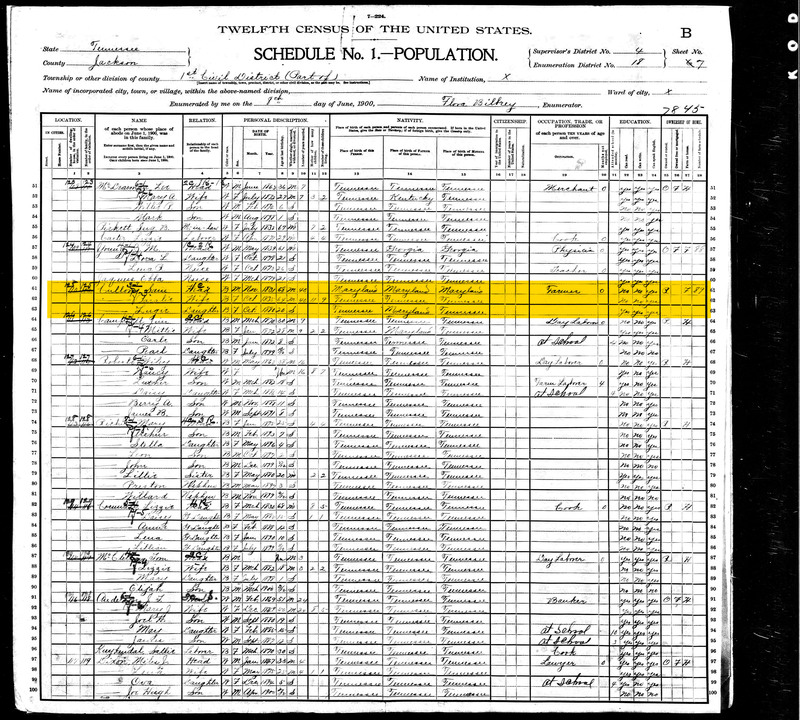 And on the 1910 census, he could have identified himself as a confederate army veteran, in which case the enumerator should have put a “CA” in column 30. 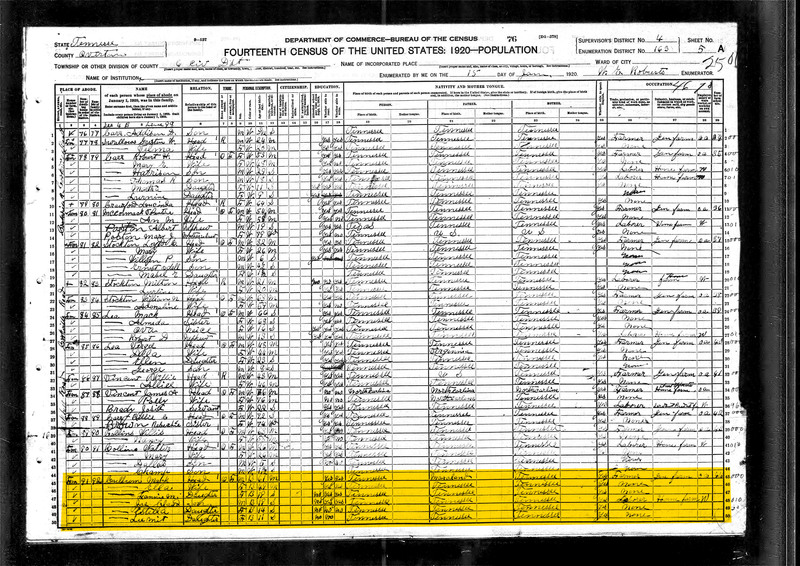 For those who did not serve, the enumerator was to leave the column blank, which the enumerator did (the penciled-in numbers and X in columns 29-32 were—as I understand—added later by tabulators at the census bureau). 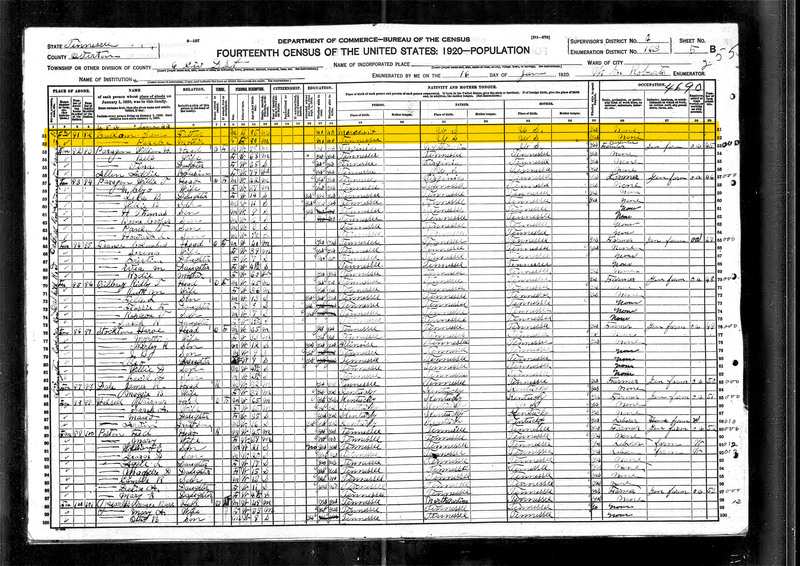 On the other hand, the enumerator, Walker D. Guthrie was a 34 year old white man who lived nearby and ran (the local?) grocery store (2) and—given the social “codes” of the time—Mr. Cullom may not have been comfortable asserting Confederate service of any kind to a white neighbor in the south in 1910, even under the confidential auspices of the census. 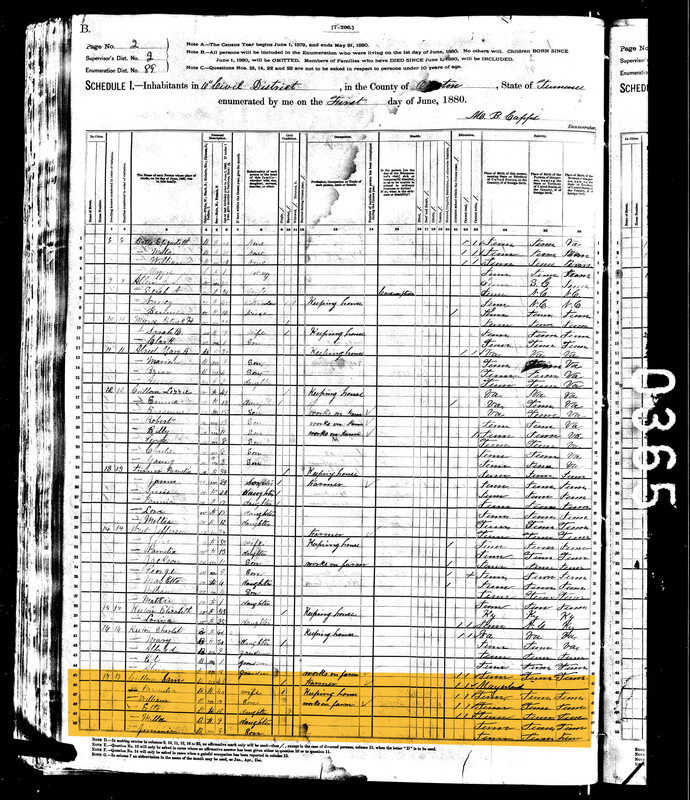 Has anyone ever seen an African-American with the “CA” code in col. 30 of the 1910 census? This is new territory for me. Perhaps others with more experience know of some. (2) Walker D. Guthrie info from U.S. Federal Census, Year: 1910; Census Place: Livingston, Overton, Tennessee; Roll: T624_1515; Page: 3B; Enumeration District: 0065; FHL microfilm: 1375528. Sam Cullom’s family appears on the next page, 4A. Fascinating stuff, thanks for sharing that. 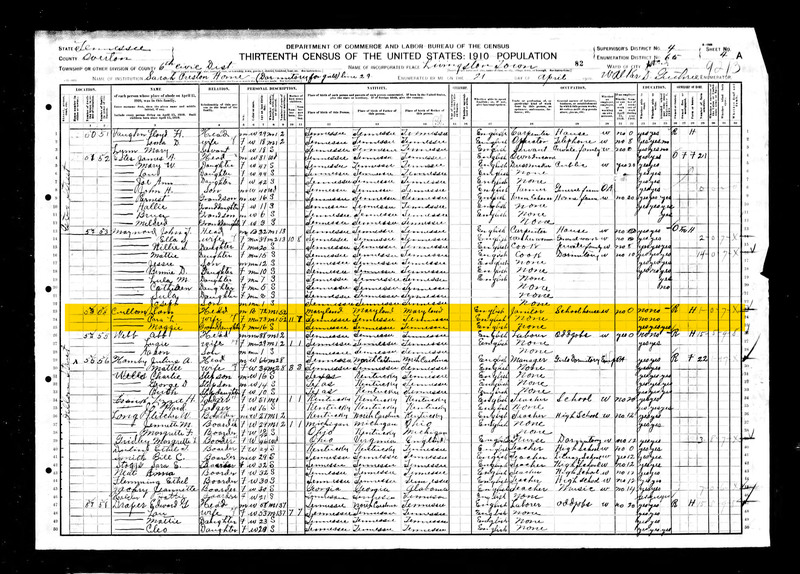 I don’t recall seeing a “CS” entry in the 1910 census, but it could well be there. In the 1890 census, the instructions from Congress were to make a separate enrollment of U.S. Civil War veterans, but many enumerators listed Confederate veterans as well. That’s really hit-and-miss. Company F seems to have come from the Livingston/Overton County area, however. Capt. Cullom was the regimental Sergeant Major at the beginning of the War and was elected Captain when the CS Army re-org occurred in ’62. In years of Civil War research, I’ve never seen a contemporary official acknowledgment of a black Confederate soldier. The headstones and the drive to recognize them is largely driven by the SCV, and the use of a rank may just be an attempt to legitimize Sam Cullom’s status as a soldier. He does not appear on the one muster roll which I have of Capt. Cullom’s company. However, there are contemporary stories of slaves and manservants, like Sam, performing many military camp duties, wearing uniforms, and even in some cases picking up muskets and taking some shots at the Yankees. And, of course, a number of Confederate states recognized their contribution to the Confederate war effort with pensions, although those laws generally weren’t passed until much later. My sense is that, since documentary evidence of actual enlistment doesn’t exist, recognizing black Confederates as soldiers, via pensions (a century ago) and veteran’s headstones (today), is simply a way of acknowledging men who made a direct contribution to the fighting ability of a unit, even without official status.